Dmitri Mendeleev or Dmitriy Ivanovich Mendeleyev (birth unknown – death, 1907) was a Russian chemist. He is credited as being the primary creator of the first version of the periodic table of elements. 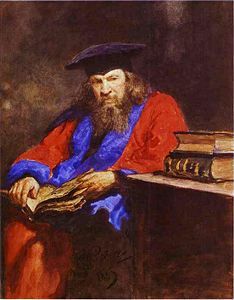 Though there were other contributors to the table, Mendeleev predicted the properties of elements yet to be discovered. Not only did he gain recognition internationally for his contributions to science, he also dedicated himself to spreading scientific knowledge at the popular level. He devoted himself to teaching science to the Russian people, and he also wanted Russia to be more integrated within Europe. He was not interested in knowledge for the sake of knowledge but in knowledge for the advancement of human society. Dmitri Mendeleev was born in Tobolsk, Siberia, to Ivan Pavlovich Mendeleev and Maria Dimitrievna Mendeleeva (nee Kornilieva). Mendeleev was the thirteenth surviving child of 17 total, but the exact number differs among sources. Soon after his birth his father became blind. As a child, he was fascinated by the glass which was created at the factory his mother owned, and for a time, the young Mendeleev worked there. At the age of 13, after the death of his father and the destruction of his mother's factory by fire, Mendeleev attended the Gymnasium in Tobolsk. In 1849, the now poor Mendeleev family relocated to St. Petersburg, where he entered the Main Pedagogical Institute in 1850. After he graduated, an illness that was diagnosed as tuberculosis caused the family to move to the Crimean Peninsula on the northern coast of the Black Sea in 1855. While there he became chief science master of the local gymnasium. Though his mother and sister succumbed to the disease, he returned with fully restored health to St. Petersburg in 1857. Between 1859 and 1861, he worked on the capillarity of liquids and the workings of the spectroscope in Heidelberg. Here he had a chance to meet Stanislao Cannizzaro, and learned his ideas on atomic weight. In 1862, he married Feozva Nikitichna Leshcheva. This marriage was arranged by his other, older sister. Though marriage arrenged by elder siblings was widely practiced in Russia at that time, Dmitri didn't really enjoy that. This could have contributed to his desire to bury in the scientific research. Mendeleev became Professor of Chemistry at the Saint Petersburg Technological Institute and the University of St. Petersburg in 1863, achieved tenure in 1867, and by 1871 had transformed St. Petersburg into an internationally recognized center for chemistry research. In 1865 he became Doctor of Science for his dissertation "On the Combinations of Water with Alcohol." In 1876, he became obsessed with Anna Ivanovna Popova and began courting her; in 1881 he proposed to her and threatened suicide if she refused. His divorce from Leshcheva was finalized one month after he had married Popova in early 1882. Even after the divorce, Mendeleev was technically a bigamist; the Russian Orthodox Church required at least seven years before lawful re-marriage. His divorce and the surrounding controversy contributed to his failure to be admitted to the Russian Academy of Sciences (despite his international fame by that time). His daughter from his second marriage, Lyubov, became the wife of the famous Russian poet Alexander Blok. His other children were son Volodya and daughter Olga, from his first marriage to Feozva, and son Ivan and a pair of twins from Anna. Though Mendeleev was widely honored by scientific organizations all over Europe, including the Copley Medal from the Royal Society of London he resigned from St. Petersburg University on August 17, 1890, in part due to his views advocating importance of social and political reforms in Russia. In 1893, he was appointed Director of the Bureau of Weights and Measures. It was in this role that he was directed to formulate new state standards for the production of vodka. His fascination with molecular weights led him to conclude that to be in perfect molecular balance, vodka should be produced in the ratio of one molecule of ethyl alcohol diluted with two molecules of water, giving a dilution by volume of approximately 38 percent alcohol to 62 percent water. As a result of his work, in 1894 new standards for vodka were introduced into Russian law and all vodka had to be produced at 40 percent alcohol by volume. Mendeleev also investigated the composition of oil fields, and helped to found the first oil refinery in Russia. Mendeleev died in 1907 in St. Petersburg, Russia from influenza. The Mendeleev crater on the Moon, as well as element number 101, the radioactive mendelevium, are named after him. One form of Mendeleev's periodic table, from the 1st English edition of his textbook (1891, based on the Russian 5th edition). After becoming a teacher, he wrote the definitive two-volume textbook at that time: Principles of Chemistry (1868-1870)—the first good book on chemistry that became a classic. As he attempted to classify the elements according to their chemical properties, he noticed patterns that led him to postulate his Periodic Table. Unknown to Mendeleev, several other scientists had also been working on their own tables of elements. One was John Newlands, who published his Law of Octaves in 1864. However, the lack of spaces for undiscovered elements and the placing of two elements in one box were criticized and his ideas were not accepted. Another was Lothar Meyer, who published a work in 1864, describing 28 elements. Like Newlands, Meyer did not seem to have the idea of using a table to predict new elements. In contrast to Newlands' methodical approach to creating a table, Mendeleev's was almost accidental and emerged gradually. By adding additional elements following this pattern, he developed his version of the periodic table. The arrangement of the elements in groups of elements in the order of their atomic weights, corresponds to their so-called valences, as well as, to some extent, to their distinctive chemical properties; as is apparent among other series in that of Li, Be, B, C, N, O, and F.
We must expect the discovery of many yet unknown elements—for example, two elements, analogous to aluminum and silicon, whose atomic weights would be between 65 and 75. The atomic weight of an element may sometimes be amended by a knowledge of those of its contiguous elements. Thus the atomic weight of tellurium must lie between 123 and 126, and cannot be 128. Here he was wrong as the atomic mass of tellurium (127.6) remains higher than that of iodine (126.9). 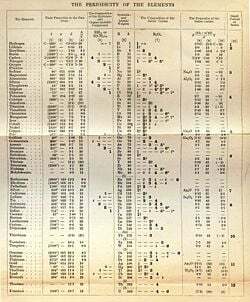 Only a few months after Mendeleev published his periodic table of all known elements (and predicted several new elements to complete the table), Meyer published a virtually identical table. Some people consider Meyer and Mendeleev the co-creators of the periodic table, although most agree that Mendeleev's accurate prediction of the qualities of what he called eka-silicon (germanium), eka-aluminum (gallium), and eka-boron (scandium) qualifies him for deserving the majority of the credit. As others before him had done, he questioned the accuracy of accepted atomic weights, pointing out that they did not correspond to those predicted by the Periodic Law. Mendeleev made other important contributions to Russian chemistry. The Russian chemist and science historian L.A. Tchugayev has characterized him as "a chemist of genius, first-class physicist, a fruitful researcher in the fields of hydrodynamics, meteorology, geology, certain branches of chemical technology (explosives, petroleum, and fuels, for example) and other disciplines adjacent to chemistry and physics, a thorough expert of chemical industry and industry in general, and an original thinker in the field of economy." Mendeleev was one of the founders, in 1869, of the Russian Chemical Society. He worked on the theory and practice of protectionist trade and on agriculture. In 1902, in an attempt at a chemical conception of the Aether, he put forward a hypothesis that there existed two inert chemical elements of lesser atomic weight than hydrogen. Of these two proposed elements, he thought the lighter to be an all-penetrating, all-pervasive gas, and the slightly heavier one to be a proposed element, coronium. Mendeleev devoted much study, and made important contributions to, the determination of the nature of such indefinite compounds as solutions. In another department of physical chemistry, he investigated the expansion of liquids with heat, and devised a formula similar to Gay-Lussac's law of the uniformity of the expansion of gases, while as far back as 1861 he anticipated Thomas Andrews' conception of the critical temperature of gases by defining the absolute boiling-point of a substance as the temperature at which cohesion and heat of vaporization become equal to zero and the liquid changes to vapor, irrespective of the pressure and volume. He invented pyrocollodion, a kind of smokeless powder based on nitrocellulose. This work had been commissioned by the Russian Navy, which however did not adopt its use. In 1892 Mendeleev organized its manufacture. Mendeleev studied petroleum origin and concluded that hydrocarbons are abiogenic and form deep within the earth. He wrote: "The capital fact to note is that petroleum was born in the depths of the earth, and it is only there that we must seek its origin" (Dmitri Mendeleev, 1877). Together with his projects on coal industry, he invested a considerable time into the problems of national economy, not only pure chemistry. Beside all that, he made a lot of efforts to bring the scientific knowledge to the common folks in Russia that was not always literate. He would travel among the peasants talking to them about their most common, practical problems, along side with continious popular science writing. The tsarist regime viewed that with suspision, however, as long as he remained in the practical realm bringing actual help, it was tolerated. However, when with age his ideas became more radical and political, and moved to the lecture halls, his was strategically "promoted" to the post of Director of the Bureau of Weights and Measures. From this post Mendeleev is given credit for the introduction of the metric system to the Russian Empire, moving Russia one step closer to the integration with Europe. ↑ The number of Mendeleev's siblings is a matter of some historical dispute. This page was last modified on 17 October 2017, at 21:54.